For the fifth straight season, I made preseason predictions as to how I felt each division would play out, and for the fifth straight season I was extremely far off. For one reason or another, I’m not very good at making division predictions before a given season begins. This year, though, I hope to finally correctly predict how the postseason will play out. While I’ll likely be off, either by a little or a lot, it’s always fun to make predictions. Who knows? Maybe I’ll get lucky and have a perfect prediction of how the postseason will unfold. You never can tell what may happen in October. This is sure to be a great game between two great teams, and although it will be played up in Toronto, with the Blue Jays having home-field advantage, I think the Orioles will be able to prevail. The key reason behind that logic lies with Zach Britton, who can almost guarantee a win, should the Orioles be holding the lead heading into the ninth. With the Orioles having hit the most homers in all of baseball this season, they should be able to put together enough runs to pull out the victory, despite having to face Toronto’s Marcus Stroman. I realize it’s an even number year, and therefore the Giants should be all but guaranteed to win the entire World Series — they won in 2010, 2012 and 2014 — but I don’t even see them making it past the Wild Card game. Yes, the Giants’ starter, Madison Bumgarner, had a stupendously great year, but the Mets have a Cy Young candidate of their own on the bump, in the form of Noah Syndergaard. With this sure to be a pitcher’s duel, one run very well could be the difference, with the Mets’ lineup simply having more thump than that of the Giants. I’ve been betting against the Indians all season long, so I’m a bit hesitant to go against them after they had the season they did. But although I don’t think this will be an easy task by any means for the Red Sox, I see them overtaking the Indians, especially with the injuries Cleveland began experiencing towards the end of the regular season. Without the full health of their rotation, I don’t see the Indians overtaking Boston. For that reason, when all is said and done, the Red Sox should be the team moving on to the ALCS. This is by far the most difficult decision I had to make to this point in the post, as both teams have very even rosters from top to bottom, and each have had rotations that have struggled at times. But despite all of that, the Orioles seem to be a bit better set up for a postseason push than the Rangers do. Having likely just won the Wild Card game in my mind against the Blue Jays, I feel that Texas won’t be able to withstand the momentum of the hard-hitting and hard-throwing Orioles for the full length of the series. After several disappointing seasons in which many people envisioned great things for the Nationals only to watch them fall apart during or even before the playoffs, this is the year for the Nationals to finally win a few playoff games, in my opinion. Although they have a great deal of injuries, including those to several All-Star players, I don’t think the Dodgers will be able to compete with Washington when all is said and done, even with the best starting pitcher in baseball, Clayton Kershaw, leading their staff. 2016 is finally the year of the Cubs — or at least that’s what ninety-nine percent of the baseball world is happily telling themselves. Following a century-long drought of a World Series title, the Cubs seemingly have no holes whatsoever in their entire roster. Even though there’s a long way to go before the end of the postseason (they need to win eleven games to take home the Championship), there are still a lot of reasons to like the Cubs. I really don’t think this will be that competitive of a series, with the Mets lacking the all-around talent that the Cubs have. This will wind up being the end of the line for the Orioles as far as I’m seeing things now. If in fact they are taking on the Red Sox in the ALCS, I don’t think the Orioles will be able to beat them in the end. Even so, this series could wind up going to a sixth or possibly even seventh deciding game. It would truly be one of the best postseason series we’ve seen in quite a while, especially with it being the final season for David Ortiz. What each team lacks in pitching dominance, they more than make up for in power hitting, which could make this a back-and-forth series. If the Nationals manage to make it this far into the playoffs, it will include a small amount of luck, and I simply don’t think they will be able to defeat the powerhouse Cubs. As I’ve already stated, the Cubbies are one of the best all-around teams we’ve seen in quite some time, and the Nationals don’t seem to have what it takes to take down a team such as Chicago. With that said, I still think it would end up being an exciting matchup, just not quite as good as the ALCS would be. But then again, it’s October baseball, where the impossible happens on a regular basis. What a World Series matchup this would be, between two great teams and taking place at two 100-year-old ballparks. With the Cubs looking to end their historical 108-year losing streak, and the Red Sox looking to send David Ortiz off into the sunset with style, neither team would want to give an inch in this series. I could easily see this matchup taking six or seven games to decide, with the Cubs ultimately just beating out the Red Sox. Thus, after nearly eleven decades without a World Title, I’m predicting this to finally be the year the Cubs win the World Series. Despite losing to the Yankees on Wednesday night via a Mark Teixeira walk-off grand slam, the Red Sox still managed to pick up a major victory. With the Orioles defeating the Blue Jays, Boston has now officially snatched up the final division title slot remaining in baseball, leaving just the Wild Card spots to be decided. Joining the Indians, Rangers, Nationals, Cubs and Dodgers as the other divisional winners from around baseball, the Red Sox have had a somewhat unpredicted fantastic season. Following a last-place finish in the American League East just a year ago, the Red Sox stormed back to take the division crown once again in 2016, picking up a whopping 14 more wins thus far than last year. One of the most remarkable things about Boston’s ability to take the division title is their doing so within a division that has once again emerged as one of the best in all of baseball — every team except the Rays have been in the postseason race all season long — in addition to having a multitude of injuries and underperformances (namely, David Price) throughout the year. With all of the top spots in all six divisions out of reach for the other twenty-four teams in baseball, there now remains just six teams still mathematically in contention for one of the two Wild Card spots in the American League, with three doing the same in the National League. Having four games remaining in the season (the days until the postseason can now be counted on one hand), it should be fun to watch how things unfold. As great as the regular season has been, the best is inevitably yet to come. Whenever a player who has had an amazing career announces plans to retire after any given season, you inevitably find yourself rooting for their team to go all the way and win the World Series so that the player can retire on top for their career with one final Championship. However, that unfortunately almost never happens. Over the past several seasons, we’ve seen the retirements of some great players and fan-favorites, such as Torii Hunter (Twins finished 12 games back of the Royals), Derek Jeter (Yankees finished second to the Orioles), Mariano Rivera (Yankees finished in fourth place) and Chipper Jones (Braves made playoffs, but no World Series), just to name a few. But none of those players were on teams capable of going all the way to the World Series. This season, I feel the Red Sox stand a decent chance of changing that fortune. Announcing his plans to retire after the 2016 season — plans that many are questioning with the superb numbers he is posting — David Ortiz is looking to record one final star season of what is arguably a Hall of Fame career, for a Red Sox team that he has impacted time and time again over the years. It would be fitting if they returned the favor and helped lead Boston to another World Title. Despite finishing in dead-last in 2015, the Red Sox currently sit tied with the Orioles atop the American League East division standings. Although they’ve been a bit shaky at times, there have been other games that lead you to believe that the Sox could actually pull off the World Series sendoff for Ortiz. But getting to the World Series is hard, with winning it being even harder. Some great players like Barry Bonds, Edgar Martinez, Craig Biggio, etc., never won a World Series title, even though they had great careers with some good teams. However, Ortiz already knows what it’s like to win it all, having won a World Title with the Red Sox in 2004, 2007 and 2013. He assuredly would love that feeling again in 2016. Ortiz is certainly doing his part to make that happen. Over the course of 40 games this season, Ortiz is hitting .329 with 11 home runs (giving him 514 for his career) and 37 RBI’s — second to Robinson Cano for most in all of baseball. If he were to keep up that pace, he would wind up with around 35-40 homers and well over 100 RBI’s. Given, there are a lot of games still to be played, but what Ortiz is doing is simply remarkable. But it’s not just Ortiz fueling the Red Sox and their march towards a fantastic season. Several players are breaking out into becoming stars, such as Xander Bogaerts, Mookie Betts, Travis Shaw and Jackie Bradley Jr. (as well as Brock Holt, before his injury), with Hanley Ramirez performing the way he was expected to when he was signed before last season. Xander Bogaerts leads the team in batting average at .346, and is followed closely behind by Jackie Bradley Jr.’s .342 line, who is currently riding a 27-game hitting streak. In addition, Mookie Betts is second on the team in homers with 9, with Travis Shaw stepping up at third without Pablo Sandoval and making a big impact himself; as well as Hanley Ramirez who has shown some pop and is hitting above .300 on the season. With all of these pieces clicking, their lineup looks to be in good shape. However, if there would be one thing that would keep the Red Sox from going all the way to a World Title, it would be their pitching. Good hitting can carry a team for awhile (the Red Sox are first in baseball in team batting average and RBI’s), despite a struggling rotation (Boston is 19th in team ERA), but eventually it won’t end up being enough, with those types of teams crumbling more times than not. Steven Wright and Rick Porcello have been the Red Sox’s most reliable starters, being the only two pitchers of their rotation with an ERA below 4.00. David Price, who was acquired in the offseason to be the ace of the staff, has had a few games where he dominated opposing hitters, but overall he’s been a big disappointment, with an ERA of 5.53 over 9 starts. Clay Buchholz has been even worse, holding a 5.92 ERA, and leaving the Red Sox looking for answers in that department. Their bullpen, on the other hand, has been stellar, for the most part. When the game has gone to closer Craig Kimbrel in a save situation, he has looked like the Kimbrel of old, striking out 31 over 19 innings pitched and saving 12 out of 13 games he’s come in to close. Other guys, such as Junichi Tazawa, Matt Barnes, Tommy Layne and Heath Hembree have also done terrific jobs. But it’s their rotation that has left more to be desired. Even so, the Red Sox appear to have things figured out enough that they can continue to win on a regular basis, despite their flaws. If their rotation begins to pitch the way it was envisioned to, the Red Sox could absolutely take off and run away with things, keeping in mind that it’s still very early, with over 100 games remaining. But even if the Red Sox fall apart over the remainder of the season, or make the playoffs and simply can’t go the entire distance, David Ortiz is still on pace to have one of the best seasons of his career . . . at age 40. If David Ortiz can’t go out on top with a World Title, he’ll certainly still leave with a bang. In the history of Major League Baseball, there have been very few pitchers who have actually succeeded in mastering the knuckleball to the point where they were able to absolutely dominate opposing batters on a consistent basis. For the most part, pitchers who throw the knuckleball are ineffective, and have up-and-down, short-lived careers. However, as with anything, there are always a few exceptions — Phil Niekro, Tim Wakefield, etc. — with the latest example of that being Steven Wright of the Boston Red Sox. Through four games started this season, Steven Wright has a 1.37 ERA, with a tick under one strikeout per inning pitched. Following an ERA of 4.09 in 2015, Wright appears to have figured things out. On Wednesday night alone, Wright went seven strong innings against the Braves (given, Atlanta isn’t exactly a powerhouse team this season), striking out eight and giving up just two runs (only one earned run) in Boston’s 9-4 win. Due to his great performance to this point in the season, Wright has subsequently taken over the leading role of most dominant MLB knuckleballer, recently held by R.A. Dickey (the only other active knuckleball thrower). With Toronto this season, Dickey has recorded a subpar 6.75 ERA, and hasn’t been all that terribly great since he took home the Cy Young award in 2012 with the Mets. That season — the only extremely fantastic season of his career — Dickey posted a 2.73 ERA over 33 starts, while striking out 230 batters, but he’s gone 40-40 with a 4.06 ERA since then. Steven Wright didn’t actually appear in the big leagues until the season after Dickey had his breakout year, but it appears that Wright is on the verge of having a special season as a knuckleball pitcher much like the one of Dickey in 2012. 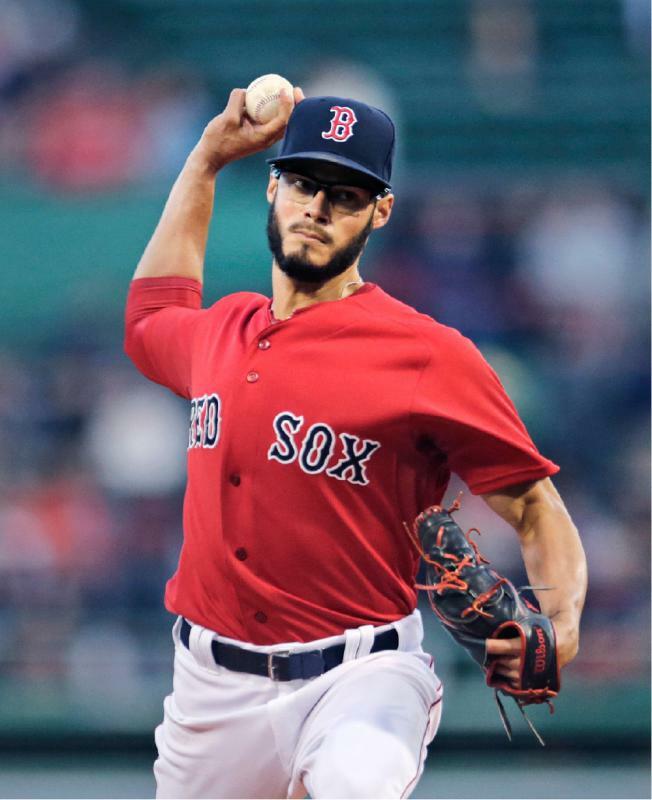 Boston could certainly continue to use successful outings from him, as their other starters hold ERA’s above 3.51, with David Price possessing a 5.76 and Joe Kelly unbelievably having a 9.35 ERA over three starts. For that reason, Steven Wright is currently being looked at as the surprising Ace of the staff, and has been a welcome surprise for the Red Sox so far this year. While I’m not necessarily saying that Steven Wright’s 2016 season will end up being as successful as R.A. Dickey’s 2012 campaign, with him winning the Cy Young, it is definitely a positive sign for Wright of great things to come. I imagine not even Wright himself would have envisioned this good of a start to the season when things began back on April 4th, but every given baseball season is much like the knuckleball pitch itself: You never know where it’s going to wind up. When the Boston Red Sox signed Pablo Sandoval to a five-year, 95 million dollar contract heading into the 2015 season, all signs pointed towards him continuing to add to his historically good career statistics that he had posted over the previous six seasons in San Francisco. With the Giants, Sandoval hit twelve or more homers, recorded at least 63 RBI’s and notched a batting average in the mid to upper .200’s from 2009 to 2014, before signing with the Red Sox in November of 2014. With that kind of track record, things were looking bright at third base in Boston. But it all completely fell apart for ‘The Panda’ last season, when he really struggled offensively, hitting just .245 on the year, with career lows of just ten homers and 47 RBI’s. However, it was his poor defense at third, leading to fifteen errors, that really stood out; and that is ultimately going to keep him on the bench to begin 2016. After two All-Star game selections and three World Series rings with the Giants, Sandoval will be on the outside looking in to begin his eighth full season in the bigs. Instead, it’s standout 2015 rookie, Travis Shaw, who received the nod from manager John Farrell to start Opening Day at the hot corner. Following a debut season of thirteen home runs over the course of just 65 games, Shaw hit the ground running in Florida’s Grapefruit League this year, recording an average well above .300, and playing a great defense at third — much better than that of Sandoval. Nonetheless, there are many people around the baseball world who don’t hold the same level of hope for Sandoval. Showing up at Spring Training around a month ago extremely out of shape, and with rumors flying that Sandoval may wind up being traded in the near future, there is no guarantee that things will ever be the same for Sandoval, at least with the Red Sox. Now that Shaw has been given the opportunity to play everyday at third base, I see him thriving there and keeping Sandoval from regaining his role there much at all. It will certainly be interesting to see how it all pans out. Opening Day for the Red Sox is now less than 100 hours away, set for Monday, April 4th, up in Cleveland against the Indians. But for Pablo Sandoval, the season will begin with him serving a role similar to the 38,000 fans expected to pack the ballpark: a mere spectator. Joe Kelly was drafted by the Cardinals in the 3rd round of the 2009 draft, despite recording a 5.65 ERA his final year at the University of California-Riverside. Following the draft, Kelly performed well in the minors and made a steady progression through the ranks from 2009 to 2012, earning a mid season call up in 2012 to the Cardinals, where he proceeded to post a 3.53 ERA over the course of 107 innings pitched. Kelly had a terrific following year in 2013 with the Cardinals, recording a 2.69 ERA over 124 innings and looked to be on his way to becoming one of the Cardinals’ top pitching options in their rotation. But after a 4.37 ERA seven game start to the 2014 season, Kelly was traded to the Red Sox where he has remained ever since. The 2015 season saw Kelly take the mound for the Red Sox 25 times, but his outings varied in consistency and his overall results were subpar. Following the up and down year, Kelly was shut down for the final portion of last season due to shoulder soreness, after a cumulative 4.82 ERA. Despite the poor year for Kelly in 2015 and subsequent talks that he may be moved to the bullpen full time, many people still feel that he can turn things around to become an effective major league starting pitcher once again. After all, he still owns a decent career ERA of 3.82, and there have been plenty of signs in the past that he has the potential to still pan out. I became most interested when I was about 5 years old. Growing up, my biggest influences were my parents. They were always so supportive and loving. My favorite baseball player was Ken Griffey Jr. He was the best player in the league. Everyone loves a winner. 3.) You were drafted by the Cardinals in the 3rd round of the 2009 draft. What was that process like for you? Where were you when you first found out? Initial thoughts? It was an awesome feeling. I was with my family and closest friends at a local pizza parlor. It was also my 21st birthday, and we had a great time celebrating all night. 4.) You made it to the World Series in 2013 with the Cardinals, and started game three. What was that overall experience like for you? Being in the World Series is a great experience that I will never forget. I can’t wait to hopefully make it back and get a ring. 5.) For the Cardinals, you pitched in around 70 games before being traded to the Red Sox midseason in 2014. What were the biggest differences you noticed about switching to pitching in the American League? How difficult was it to make the transition during the season? The biggest difference is that you don’t get to face the pitcher hitting. You actually have to focus on the number nine hitter and work for your out. It was hard in the middle of the season, because it was such short notice. I had to live in the hotel for two months in Boston. 6.) Throughout your career in the minors and majors, you’ve made the switch back and forth between the bullpen and starting rotation numerous times. How do you enable yourself to thrive in whatever role you are placed in? I just try to keep pitching simple, whether it’s in the pen or being a starter. 7.) The Red Sox made the major additions of David Price and Craig Kimbrel this past offseason to bolster your rotation and bullpen. How do you feel their presence will impact the overall makeup of the Red Sox in 2016? I think we have a really good team, and should compete for the top spot in the AL East. Adding those two guys is huge. They are great teammates and leaders. I can’t wait to play with them. 8.) After a somewhat poor start to 2015, you won eight consecutive starts from August through September before being shut down due to shoulder soreness. What do you feel you were doing differently that allowed you so much success? I just started to locate my fastball with more consistency and mixed my off speed pitches well. I hope that I will pick up right where I left off at last season. Favorite show is ‘Breaking Bad’, and favorite food is ‘In-N-Out’. I would tell kids to just have fun, throw the ball as hard as you can and swing as hard as you can. You can always teach proper mechanics later on in life. Big thanks to Joe Kelly for taking the time to answer my questions.